The subependymal giant cell astrocytoma is a slow-growing neoplasm arising from a hamartoma of periventricular cells with neuronal and glial lineage differentiation, but its inclusion derives from its historical taxonomic relationship to astrocytomas. The pilomyxoid astrocytoma is an entity with not only pilocytic features, but also intercellular mucin and aggressive growth tendencies that distinguishes it from the more indolent pilocytic astrocytoma. 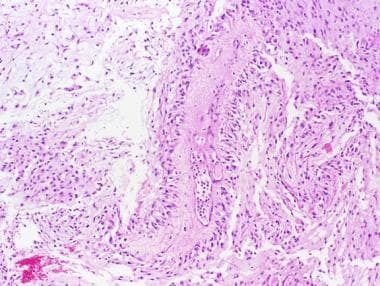 Tumors of a controversial nature and, therefore, not discussed in this article include the astroblastoma that is now best considered to be of uncertain histologic origin with ultrastructural features of tanycytes. 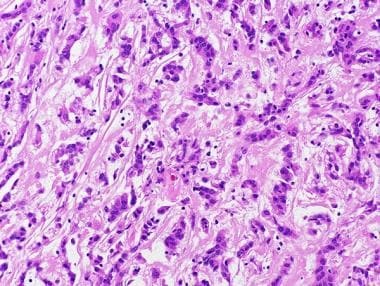 Although the polar spongioblastoma has historically been considered to be of primitive glial origin, the evidence of the polar spongioblastoma's very existence is questionable and is thought to be more akin to a growth pattern than a specific histologic type that may occur in either gliomas or tumors of neuronal origin. The image below is an example of the histologic appearance of a pilocytic astrocytoma. Pilocytic astrocytomas are slow growing tumors with an expansile growth pattern and little propensity to disseminate resulting, overall, in an excellent prognosis, as represented in the WHO grade (grade I). These tumors primarily arise in children and young adults but may remain asymptomatic until later in life. Clinically, the tumors are most commonly associated with either headaches or seizures and rarely present with focal deficits, except when they occur in the optic pathway. The clinical history of patients with pilocytic astrocytomas is usually prolonged due to the nonspecificity of the symptoms. The common anatomic sites of origin include the cerebellum, hypothalamus, thalamus, optic pathway, brainstem, and spinal cord, with symptoms most commonly referable to mass effect in these areas. Thus, patients may present with generalized symptoms of increased intracranial pressure (ICP), including headaches, visual loss, nausea and vomiting, and cognitive impairment. Symptoms may be exacerbated by cystic expansion of the tumor, such that the tumor is represented as a small mural nodule along the wall of the cyst. The etiology of pilocytic astrocytoma remains unknown in most cases. Pilocytic astrocytomas may occur in the context of neurofibromatosis type I in which the optic pathway is a typical site of origin. Although rare tumors may exhibit p53 accumulation by immunohistochemistry, mutations of the TP53 gene are not common and the tumors are not encountered in the Li-Fraumeni syndrome. Imaging studies of the brain and spinal cord are essential to make the diagnosis of pilocytic astrocytoma. On computed tomography (CT) scans, pilocytic astrocytomas most often appear as an enhancing nodule along the wall of a large cyst that is hypodense to its surroundings, and the associated cyst is of water density. An occasional tumor will exhibit calcification. Magnetic resonance imaging (MRI) with and without contrast is the study of choice for these lesions. T1-weighted images reveal the nodule to be isointense to gray matter, whereas T2-weighted images reveal the nodule to be hyperintense. With enhancement, the solid nodular component of the tumor usually enhances brightly and homogeneously. The gross and histologic pathology of pilocytic astrocytomas are briefly discussed below. The gross appearance of pilocytic astrocytomas is typically that of a well-circumscribed mass, except in those tumors arising in the region of the third ventricle and some lesions in the cerebellum, in which the tumors may take on an infiltrative appearance. As described earlier, tumors arising in the cerebellum and cerebrum may be associated with prominent cysts filled with proteinaceous fluid, with the tumor represented by a nodule along the wall. These tumors appear to have a preference for arising along the midline or adjacent to the lateral ventricles. Histologically, the pilocytic astrocytoma is composed of elongated bipolar astrocytes with round to oval nuclei that are most frequently monotonous. 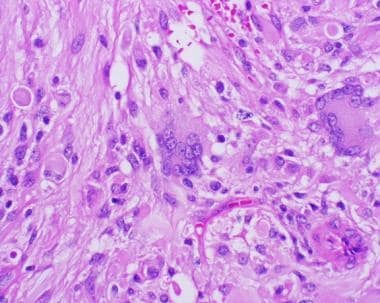 These cells are most commonly encountered in the cerebrum, where the stout tumor cells are arranged in irregular fascicles associated with eosinophilic granular bodies and Rosenthal fibers in the tightly packed tumors, as depicted in the image below. This pattern is commonly interrupted by microcysts surrounded by spindle cells oriented haphazardly toward the cyst with loose fibrillar tails extending into the watery filled microcysts, as illustrated below. This alternating pattern of compact and microcystic regions is what is referred to as a biphasic growth pattern in these tumors. However, other histologic variations occur, including regions reminiscent of oligodendroglial differentiation and regions with an infiltrative appearance, a feature commonly encountered in tumors arising in the cerebellum. The aforementioned eosinophilic granular bodies are membrane-bound, anuclear collections of bubbly eosinophilic material that may be encountered in pilocytic astrocytomas but are not unique to the tumor and that may also be found in pleomorphic xanthoastrocytoma; similarly, protein droplets, which are balls of eosinophilic solid proteinaceous material are encountered in this tumor. It is also important to recognize that some examples of pilocytic astrocytomas exhibit unexpected degrees of pleomorphism that may be associated with microvascular proliferation and infarctlike necrosis. These findings are of no prognostic importance. Pilocytic astrocytomas are strongly and diffusely immunoreactive for glial fibrillary acidic protein (GFAP) and S100. Rosenthal fibers are immunoreactive for α-B-crystallin. Insufficient data are available to indicate a typical incidence, racial predominance, and/or sexual predominance. However, pilomyxoid astrocytomas, as originally described, affect children in the first 5 years of life. Although cases in older persons have been described, such examples are less well studied from a clinicopathologic perspective regarding survival, recurrence, and morphologic appearance. 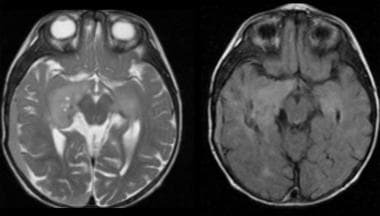 Pilomyxoid astrocytoma arising in the third ventricle most commonly presents with symptoms of increased intracranial pressure or parenchymal compression, including failure to thrive, developmental delay, altered level of consciousness, vomiting, feeding difficulties, and generalized weakness. In infants, rising intracranial pressure may present as an increase in head circumference, diastasis of the sutures, and a bulging fontanelle. Later in the disease course, children can become irritable and lethargic with altered vital signs, such as bradycardia and slowed respiration. Local symptoms, such as visual disturbances and hypothalamic dysfunction, may also be encountered in older patients. There are no specific laboratory tests that are helpful in making a diagnosis of pilomyxoid astrocytoma. Pilomyxoid astrocytomas are well-circumscribed tumors that most commonly originate in the hypothalamic/chiasmatic region. Radiographically, the tumors lack both peritumoral edema and central necrosis. Mass effect and hydrocephalus are also common. Approximately 50% of the tumors will appear solid and half cystic. 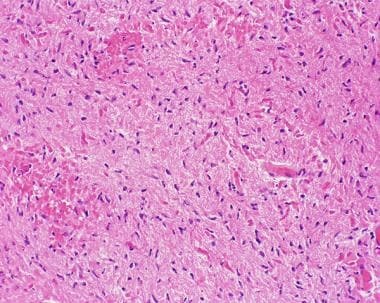 Histologically, the tumor has a resemblance to the pilocytic astrocytoma with elongated bipolar cells, but pilomyxoid astrocytoma is distinguished by its intercellular myxoid content and the perivascular or angiocentric radial orientation of the tumor cells, [7, 27] a pattern reminiscent of an ependymoma. A typical pilomyxoid astrocytoma lacks eosinophilic granular bodies and Rosenthal fibers, but some tumors reportedly will merge with the more classic pilocytic appearance either in the primary or in its recurrence. Mitotic figures are rare, although Ki-67 labeling index can be brisk. See the images below. Perivascular orientation of the tumor cells is a diagnostic feature in pilomyxoid astrocytomas, with bipolar elongated processes and abundant intercellular mucin. The pleomorphic xanthoastrocytoma (PXA) was originally described as a xanthosarcoma,  until it was recognized that a group of these tumors were not only slowly growing, but also productive of glial fibrillary acidic protein (GFAP). As a result of these findings, the tumor was set aside as a subset of astrocytomas and given the name pleomorphic xanthoastrocytoma, which reflects its histologic appearance of large, often multinucleated cells with abundant foamy cytoplasm and astrocytic phenotype. Pleomorphic xanthoastrocytoma is a slow-growing tumor with secondary findings of indolent growth, including scalloped erosion of the inner table of the calvarium. On computed tomography (CT) scans, pleomorphic xanthoastrocytomas can be cystic (43%) or solid (15%). The cystic portion of the tumor is of low density, and the solid component demonstrates mixed density. The mural nodule is hypodense and enhances strongly with contrast. The cyst wall may or may not enhance. A brief discussion of the histologic, immunohistochemical, and molecular findings of pleomorphic xanthoastrocytomas is presented below. Pleomorphic xanthoastrocytoma is characterized by elongated, spindle-shaped cells with eosinophilic cytoplasm and occasional giant cells, some of which may demonstrate foamy, or xanthomatous change (see the images below). 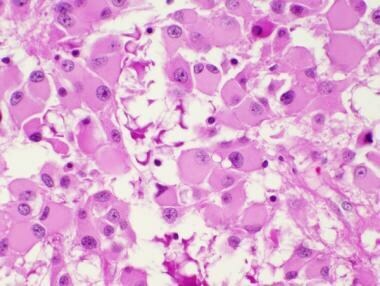 Eosinophilic granular bodies, a degenerative cellular phenomenon of unknown etiology that may also be encountered in pilocytic astrocytomas, are almost always present. The majority of these tumors also exhibit pericellular reticulin, a feature that was initially considered diagnostic but was subsequently found to be less reliable. The reticulin corresponds to a basal lamina associated with each tumor cell. Lymphocytic and plasma cellular infiltrates are also a common finding. Pleomorphic xanthoastrocytoma has a strong tendency to show nonphosphorylated neurofilament protein immunoreactive cells. Indeed, several of these tumors have been described to be a component of gangliogliomas, but it is unlikely that there is more to the relationship between pleomorphic xanthoastrocytoma and ganglioglioma. Neurofilament protein localization may be a useful way to distinguish this tumor from giant cell glioblastomas. CD34 has also been seen in these tumors. Desmoplastic astrocytomas and desmoplastic infantile gangliogliomas are tumors largely confined to infants. They typically seem to evolve rapidly as large supratentorial complex tumors adherent to the dura and producing significant mass effect. [40, 42] Neurologic symptoms and signs affecting infants with desmoplastic astrocytomas can be either general or focal and reflect the location of the tumor. The most common anatomic site of origin for desmoplastic astrocytoma is a frontoparietal location with attachment to the dura and an association with a prominent cyst. Increasing head circumference, bulging fontanelles, and downward deviation of the eyes are common manifestations. Nonlocalizing symptoms are typical with lethargy and irritability, and seizures, although cranial nerve palsies are also encountered. The deeply situated desmoplastic astrocytoma can be identified by both (left) T2-weighted magnetic resonance images and (right) fluid-attenuated inversion recovery (FLAIR) images. Desmoplastic infantile gangliogliomas can present with large size, often associated with cerebral shifts and even herniations. In fact, the radiographic appearance is so characteristic as to be diagnostic in infants. 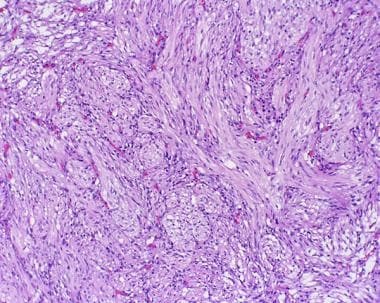 The tumor is a large, multilobulated mass with 1 or more cysts that is adherent to the dura. Mass effect is related to its enormous size due to the cystic expansion. Solid regions are isodense to slightly hyperdense on CT scans, whereas MRI T1-weighted images exhibit isointensity to gray matter, and T2-weighted images are heterogeneous. Fluid attenuated inversion recovery (FLAIR) images show the mass to be hyperintense. Desmoplastic astrocytomas and desmoplastic infantile gangliogliomas raise the issue of meningioma due to their broad-based dural attachments, tough rubbery consistency (owing to their collagenous contents), and their sharp demarcation from the underlying brain parenchyma. 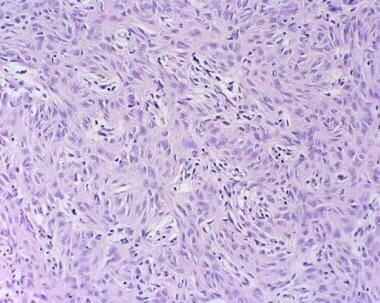 Histologically, the tumor exhibits striking variability, ranging from intense hypercellularity of a small blue cell tumor to the sparse, fibrotic appearance of a fibroblastic meningioma (see the images below). Embedded within the spindle-shaped cells of the latter appearance are glial fibrillary acidic protein (GFAP) – immunoreactive astrocytes and an occasional synaptophysin immunoreactive neuron. 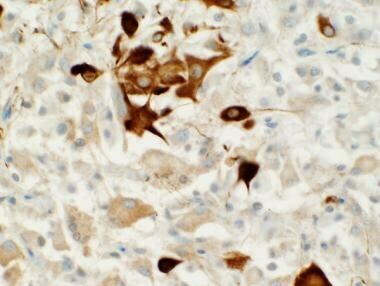 The finding of regions with embedded astrocytes may raise the issue of gliosarcoma; however, the Ki-67 labeling index of this portion is low. Desmoplastic infantile gangliogliomas may show sharp transitions between the densely hypercellular regions and the fibrotic regions. 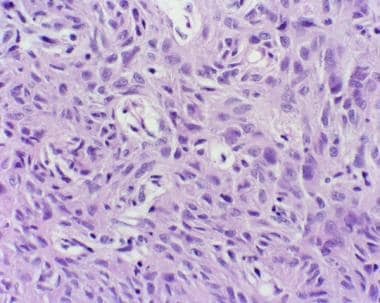 Other regions are typical of ganglion cell tumors, with protein droplets and eosinophilic granular bodies present. This histologic variability may not be evident in small biopsies of tumors arising in eloquent areas such as the brainstem, and they may not become apparent until later biopsies suggest a completely different diagnosis. Immunohistochemistry can be useful in characterizing these lesions as astrocytes, and neurons may be found embedded within collagenized spindle cells. The desmoplastic regions are characterized by pericellular reticulin. Ki-67 labeling indices are typically low and do not appear to exceed 10%, even in the most hypercellular regions. Tumors with higher labeling indices have been reported to be associated with a poor prognosis and an anaplastic histologic appearance,  although apparently this is not completely reliable. See the following images. There are no laboratory tests that are specific to a diagnosis of chordoid glioma. However, in the setting of panhypopituitarism, chordoid glioma should be considered as part of the differential diagnosis. The histologic and immunohistochemical findings of chordoid gliomas are briefly discussed. Chordoid gliomas exhibit cords and clusters of epithelioid tumor cells in a mucinous, often vacuolated, periodic acid Schiff [PAS]–positive background. In areas where the chordoid arrangement is less prominent, the tumor cells can form solid sheets, with decreased extracellular mucin. The cells themselves are generally oval, with a large quantity of eosinophilic cytoplasm, moderate in size, and relatively uniform in appearance. 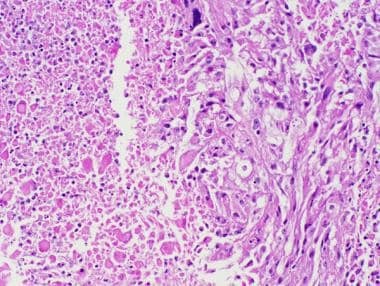 The tumor has a low grade histologic appearance, without nuclear pleomorphism or mitotic activity. A stromal lymphoplasmacytic infiltrate and Russell bodies are often associated with these tumors, providing a helpful clue in the classification of chordoid gliomas and distinguishing them from other gliomas arising in the hypothalamus. [12, 66] See the images below. 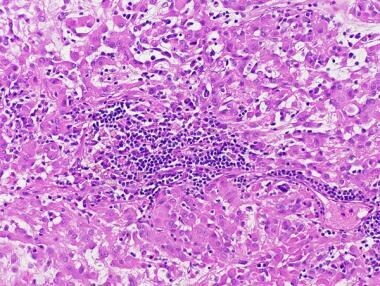 Chordoid glioma with a prominent collection of inflammatory cells. 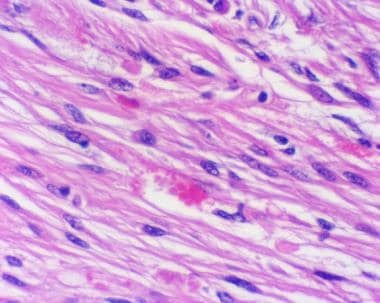 Chordoid glioma is characterized by cords of epithelioid cells embedded in a mucinous background, reminiscent of the chordoma. Its intracerebral location rules out this latter possibility. 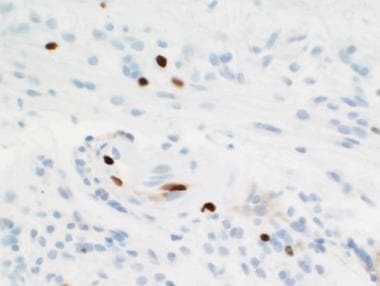 Immunohistochemical stains also help to identify these tumors, as chordoid gliomas generally exhibit a strong, diffuse reactivity for GFAP, vimentin, and CD34. [66, 67] Additionally, the tumors invariably show immunoreactivity for epidermal growth factor receptor (EGFR) and schwannomin/merlin with no nuclear accumulation of p53, p21 (Waf-1) or MDM2 proteins. S100 immunoreactivity is variable, and epithelial membrane antigen (EMA) can be focally positive, but it is generally more conspicuous in stromal plasma cells. The location of chordoid gliomas and the intimate association with the hypothalamic and suprasellar structures of necessity affects the surgical approach and ultimate prognosis. Gross total resection is the treatment of choice, with no recurrence reported after macroscopically complete resection; unfortunately, this procedure is considered too risky in a significant proportion of patients. In a literature review of 51 reported cases of chordoid glioma, only 23 patients received a gross total resection. The majority of the remainder (22 patients) received subtotal resections. Postoperative follow-up information was available on 38 patients, revealing an overall 32% mortality rate in the immediate postoperative period; the mortality rate was higher in patients who received total resections (8/22) than in those who underwent subtotal resections (4/23). Nonfatal complications included hypothalamic disorders such as transient diabetes insipidus, hypotension, hypothermia, as well as mental alterations. Pituicytoma is defined as a solid, circumscribed, low-grade, spindle-cell astrocytic tumor of adults having an origin in the posterior pituitary or its stalk. Also known as infundibular astrocytoma (infundibuloma), these tumors are considered by the World Health Organization (WHO) to be grade I. Although some authors have noted that pituicytomas may be indistinguishable from the classic pilocytic astrocytoma encountered elsewhere in the brain, Brat et al pointed out that their collection of tumors lacked the biphasic compact and microcystic patterns, Rosenthal fiber accumulation, and eosinophilic granular bodies that typify the classic pilocytic type. In Brat et al's large series, all were "solid architecturally and consisted of elongate, bipolar spindle cells arranged in interlacing fascicles and/or a storiform pattern." Of 5 cases in which adjacent normal tissue was seen, no infiltration was noted. There are no specific laboratory tests that are helpful in making a specific diagnosis of pituicytoma, although they are in the differential diagnosis of tumors of the sellar and suprasellar region causing hypopituitarism and/or hyperprolactinemia. Imaging features of pituicytomas are nonspecific, but magnetic resonance images (MRIs) combined with angiograms are critical for surgical planning. The tumors are isointense on T1-weighted images and enhance homogeneously with gadolinium administration. See the image below. Pituicytomas arise in the hypothalamus or pituitary stalk and are isointense to gray matter, but they enhance brightly with gadolinium. 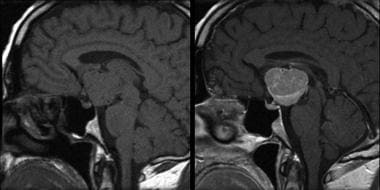 (Left) T1-weighted magnetic resonance image and (right) T1-weighted image with gadolinium enhancement. A few pathology features are discussed in brief. Pituicytomas arises as a solid, well-circumscribed mass along the tract of the neurohypophysis. The tumor is described as firm and rubbery and is often attached to its surrounding structures. Pituicytomas are composed of fascicles of bipolar astrocytes that interweave in haphazard patterns. In contrast to the piloid astrocyte, the individually discrete tumor cells are more plump and cluster together in a fashion likened to heads of wheat. Their nuclei are monomorphic, elongated ovals with little atypia or variation in size with only rare mitoses encountered. The tumor is distinguished from the pilocytic astrocytoma by a lack of Rosenthal fibers and eosinophilic granular bodies and from the pilomyxoid astrocytoma by its lack of intercellular mucin. The plump cytoplasm may bring to mind the granular cell tumor or the oncocytoma, but its lack of cytoplasmic granularity rules this option out. See the following images. MIB-1 labeling indices are uniformly low in these tumors, ranging from 0.5% to 2%. There are insufficient data concerning the management of pituicytomas, or their long-term prognosis, although there is little reason to suspect that their biology would be any less favorable than that of astrocytomas of the pilocytic type arising elsewhere. In such situations, surgical accessibility, rather than tumor biology, will be the decisive prognostic determinant. Patients with tuberous sclerosis are prone to develop these tumors, whereas subependymal giant cell astrocytomas are rarely, if ever, encountered outside of patients with the disease. Such patients exhibit a germline mutation of either the TSC1 or TSC2, with no clinical distinction evident on which gene is mutated. Indeed, the only known risk factor for developing a subependymal giant cell astrocytoma is a germline mutation of 1 of these 2 genes. Tuberous sclerosis is estimated to occur in 1 in 9,400-10,000 births,  with variable penetrance rendering accurate rates fallible. The prevalence of subependymal gian cell astrocytomas in the general population of tuberous sclerosis has been estimated to be 1:20,000 to 1:150,000. No racial or sexual predilection is known, and the tumor is most commonly diagnosed during the first 2 decades of life. As subependymal giant cell astrocytomas are limited to persons with tuberous sclerosis, it is difficult to dissect the manifestations of these tumors away from those of its host disease. Patients with tuberous sclerosis may manifest in a variety of ways, including infantile spasms, autism, or mental retardation. Epilepsy is manifest in up to 85% of these patients. In a report of 23 patients with subependymal giant cell astrocytoma, the majority of patients presented with visual disturbances (82.6%) in the form of decreased vision (60.8%) and blindness (21.7%), generalized tonic clonic seizures (43.4%), and focal motor seizures (4.37%). Clearly, hydrocephalus is a manifestation of a large obstructive subependymal giant cell astrocytoma. There are no specific laboratory tests that are helpful in making a diagnosis of subependymal giant cell astrocytoma. T1-weighted magnetic resonance images of a subependymal giant cell astrocytoma reveal the tumors to be homogeneous to gray matter (a, c) and to brightly enhance with gadolinium (b, d). A brief review of the gross, histologic, and immunohistochemical findings of subependymal giant cell astrocytomas is presented. Grossly, the tumors are well circumscribed, exophytic lesions that may be uniformly gray white or mottled pink on cut section. 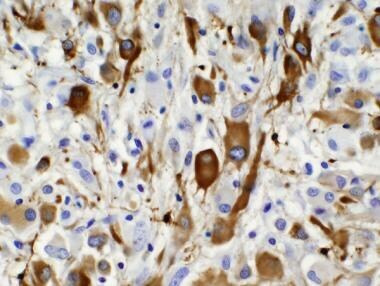 Immunohistochemically, the tumor cells will exhibit a heterogeneous immunoreactivity with both the astrocytic marker glial fibrillary acidic protein (GFAP) and the neuronal markers neurofilament protein and synaptophysin. The phenotypic ambiguity also extends to the cortical tubers with their balloon cells and less prominent gemistocytic type cells. See the following images. The overall survival in patients with subependymal giant cell astrocytomas is excellent even with partial resection. The tumors are slow growing and may assume prolonged stability. Brat DJ, Scheithauer BW, Fuller GN, Tihan T. Newly codified glial neoplasms of the 2007 WHO Classification of Tumours of the Central Nervous System: angiocentric glioma, pilomyxoid astrocytoma and pituicytoma. Brain Pathol. 2007 Jul. 17(3):319-24. [Medline]. Khatib ZA, Heideman RL, Kovnar EH, et al. Predominance of pilocytic histology in dorsally exophytic brain stem tumors. Pediatr Neurosurg. 1994. 20(1):2-10. [Medline]. Fisher PG, Breiter SN, Carson BS, et al. A clinicopathologic reappraisal of brain stem tumor classification. Identification of pilocystic astrocytoma and fibrillary astrocytoma as distinct entities. Cancer. 2000 Oct 1. 89(7):1569-76. [Medline]. Reis GF, Tihan T. Practical molecular pathologic diagnosis of pilocytic astrocytomas. Surg Pathol Clin. 2015 Mar. 8(1):63-71. [Medline]. Wilson WB, Feinsod M, Hoyt WF, Nielsen SL. Malignant evolution of childhood chiasmal pilocytic astrocytoma. Neurology. 1976 Apr. 26(4):322-5. [Medline]. Cummings TJ, Provenzale JM, Hunter SB, et al. Gliomas of the optic nerve: histological, immunohistochemical (MIB-1 and p53), and MRI analysis. Acta Neuropathol. 2000 May. 99(5):563-70. [Medline]. Tihan T, Fisher PG, Kepner JL, et al. Pediatric astrocytomas with monomorphous pilomyxoid features and a less favorable outcome. J Neuropathol Exp Neurol. 1999 Oct. 58(10):1061-8. [Medline]. Giannini C, Scheithauer BW, Burger PC, et al. Cellular proliferation in pilocytic and diffuse astrocytomas. J Neuropathol Exp Neurol. 1999 Jan. 58(1):46-53. [Medline]. Bowers DC, Gargan L, Kapur P, et al. Study of the MIB-1 labeling index as a predictor of tumor progression in pilocytic astrocytomas in children and adolescents. J Clin Oncol. 2003 Aug 1. 21(15):2968-73. [Medline]. Barton VN, Donson AM, Birks DK, et al. Insulin-like growth factor 2 mRNA binding protein 3 expression is an independent prognostic factor in pediatric pilocytic and pilomyxoid astrocytoma. J Neuropathol Exp Neurol. 2013 May. 72(5):442-9. [Medline]. Louis DN, Ohgaki H, Wiestler OD, Cavenee WK. WHO Classification of Tumours of the Central Nervous System. 4th ed. Lyons, France: IARC Press; 2007. Wiltshire RN, Herndon JE 2nd, Lloyd A, et al. Comparative genomic hybridization analysis of astrocytomas: prognostic and diagnostic implications. J Mol Diagn. 2004 Aug. 6(3):166-79. [Medline]. [Full Text]. Rodriguez FJ, Giannini C, Asmann YW, et al. Gene expression profiling of NF-1-associated and sporadic pilocytic astrocytoma identifies aldehyde dehydrogenase 1 family member L1 (ALDH1L1) as an underexpressed candidate biomarker in aggressive subtypes. J Neuropathol Exp Neurol. 2008 Dec. 67(12):1194-204. [Medline]. [Full Text]. Forshew T, Tatevossian RG, Lawson AR, et al. Activation of the ERK/MAPK pathway: a signature genetic defect in posterior fossa pilocytic astrocytomas. J Pathol. 2009 Jun. 218(2):172-81. [Medline]. Bar EE, Lin A, Tihan T, Burger PC, Eberhart CG. Frequent gains at chromosome 7q34 involving BRAF in pilocytic astrocytoma. J Neuropathol Exp Neurol. 2008 Sep. 67(9):878-87. [Medline]. Korshunov A, Meyer J, Capper D, et al. Combined molecular analysis of BRAF and IDH1 distinguishes pilocytic astrocytoma from diffuse astrocytoma. Acta Neuropathol. 2009 Sep. 118(3):401-5. [Medline]. Schindler G, Capper D, Meyer J, et al. Analysis of BRAF V600E mutation in 1,320 nervous system tumors reveals high mutation frequencies in pleomorphic xanthoastrocytoma, ganglioglioma and extra-cerebellar pilocytic astrocytoma. Acta Neuropathol. 2011 Mar. 121(3):397-405. [Medline]. Cummings TJ, Chu CT, McLendon RE. Long term recurrent juvenile pilocytic astrocytomas of the cerebellum: histologic and pathologic studies [abstract]. Presented at: 75th Annual Meeting of the American Association of Neuropathologists; June 17-20, 1999; Portland, Oregon. J Neuropathol Exp Neurol. 1999. 58(5):538. Dirks PB, Jay V, Becker LE, et al. Development of anaplastic changes in low-grade astrocytomas of childhood. Neurosurgery. 1994 Jan. 34(1):68-78. [Medline]. Janisch W, Schreiber D, Martin H, Gerlach H. [Diencephalic pilocytic astrocytoma with clinical onset in infancy. Biological behavior and pathomorphological findings in 11 children] [German]. Zentralbl Allg Pathol. 1985. 130(1):31-43. [Medline]. Cottingham SL, Boesel CP, Yates AJ. Pilocytic astrocytoma in infants: a distinctive histologic pattern [abstract]. J Neuropathol Exp Neurol. 1996. 55:654. Komotar RJ, Burger PC, Carson BS, et al. Pilocytic and pilomyxoid hypothalamic/chiasmatic astrocytomas. Neurosurgery. 2004 Jan. 54(1):72-9; discussion 79-80. [Medline]. Chikai K, Ohnishi A, Kato T, et al. Clinico-pathological features of pilomyxoid astrocytoma of the optic pathway. Acta Neuropathol. 2004 Aug. 108(2):109-14. [Medline]. Ceppa EP, Bouffet E, Griebel R, Robinson C, Tihan T. The pilomyxoid astrocytoma and its relationship to pilocytic astrocytoma: report of a case and a critical review of the entity. J Neurooncol. 2007 Jan. 81(2):191-6. [Medline]. Morales H, Kwock L, Castillo M. Magnetic resonance imaging and spectroscopy of pilomyxoid astrocytomas: case reports and comparison with pilocytic astrocytomas. J Comput Assist Tomogr. 2007 Sep-Oct. 31(5):682-7. [Medline]. Burger PC, Cohen KJ, Rosenblum MK, Tihan T. Pathology of diencephalic astrocytomas. Pediatr Neurosurg. 2000 Apr. 32(4):214-9. [Medline]. Lehman NL. Central nervous system tumors with ependymal features: a broadened spectrum of primarily ependymal differentiation?. J Neuropathol Exp Neurol. 2008 Mar. 67(3):177-88. [Medline]. Kepes JJ, Rubinstein LJ, Eng LF. Pleomorphic xanthoastrocytoma: a distinctive meningocerebral glioma of young subjects with relatively favorable prognosis. A study of 12 cases. Cancer. 1979 Nov. 44(5):1839-52. [Medline]. Sugita Y, Shigemori M, Okamoto K, Morimatsu M, Arakawa M, Nakayama K. Clinicopathological study of pleomorphic xanthoastrocytoma: correlation between histological features and prognosis. Pathol Int. 2000 Sep. 50(9):703-8. [Medline]. McLendon RE, Gray L, Shah LM, Friedman AH. Pleomorphic xanthoastrocytoma. McLendon RE, Rosenblum MK, Bigner DD, eds. Russell and Rubinstein's Pathology of Tumors of the Nervous System. 7th ed. London, UK: Edward Arnold; 2006. 147-56. Allegranza A, Ferraresi S, Bruzzone M, Giombini S. Cerebromeningeal pleomorphic xanthoastrocytoma. Report on four cases: clinical, radiologic and pathological features. (Including a case with malignant evolution). Neurosurg Rev. 1991. 14(1):43-9. [Medline]. Lipper MH, Eberhard DA, Phillips CD, Vezina LG, Cail WS. Pleomorphic xanthoastrocytoma, a distinctive astroglial tumor: neuroradiologic and pathologic features. AJNR Am J Neuroradiol. 1993 Nov-Dec. 14(6):1397-404. [Medline]. Giannini C, Scheithauer BW, Burger PC, et al. Pleomorphic xanthoastrocytoma: what do we really know about it?. Cancer. 1999 May 1. 85(9):2033-45. [Medline]. Martinez-Diaz H, Kleinschmidt-DeMasters BK, Powell SZ, Yachnis AT. 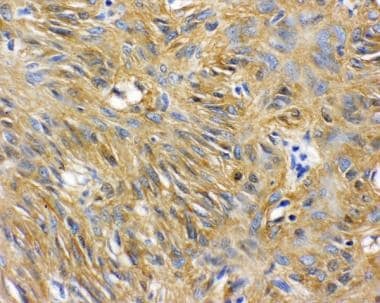 Giant cell glioblastoma and pleomorphic xanthoastrocytoma show different immunohistochemical profiles for neuronal antigens and p53 but share reactivity for class III beta-tubulin. Arch Pathol Lab Med. 2003 Sep. 127(9):1187-91. [Medline]. Grau E, Balaguer J, Canete A, et al. Subtelomeric analysis of pediatric astrocytoma: subchromosomal instability is a distinctive feature of pleomorphic xanthoastrocytoma. J Neurooncol. 2009 Jun. 93(2):175-82. [Medline]. Bayindir C, Balak N, Karasu A, Kasaroglu D. Anaplastic pleomorphic xanthoastrocytoma. Childs Nerv Syst. 1997 Jan. 13(1):50-6. [Medline]. Hirose T, Ishizawa K, Sugiyama K, Kageji T, Ueki K, Kannuki S. Pleomorphic xanthoastrocytoma: a comparative pathological study between conventional and anaplastic types. Histopathology. 2008 Jan. 52(2):183-93. [Medline]. Koga T, Morita A, Maruyama K, et al. Long-term control of disseminated pleomorphic xanthoastrocytoma with anaplastic features by means of stereotactic irradiation. Neuro Oncol. 2009 Aug. 11(4):446-51. [Medline]. [Full Text]. Taratuto AL, Monges J, Lylyk P, Leiguarda R. Superficial cerebral astrocytoma attached to dura. Report of six cases in infants. Cancer. 1984 Dec 1. 54(11):2505-12. [Medline]. Louis DN, von Deimling A, Dickersin GR, Dooling EC, Seizinger BR. Desmoplastic cerebral astrocytomas of infancy: a histopathologic, immunohistochemical, ultrastructural, and molecular genetic study. Hum Pathol. 1992 Dec. 23(12):1402-9. [Medline]. VandenBerg SR, May EE, Rubinstein LJ, et al. Desmoplastic supratentorial neuroepithelial tumors of infancy with divergent differentiation potential ("desmoplastic infantile gangliogliomas"). Report on 11 cases of a distinctive embryonal tumor with favorable prognosis. J Neurosurg. 1987 Jan. 66(1):58-71. [Medline]. Ganesan K, Desai S, Udwadia-Hegde A. Non-infantile variant of desmoplastic ganglioglioma: a report of 2 cases. Pediatr Radiol. 2006 Jun. 36(6):541-5. [Medline]. Balaji R, Ramachandran K. Imaging of desmoplastic infantile ganglioglioma: a spectroscopic viewpoint. Childs Nerv Syst. 2009 Apr. 25(4):497-501. [Medline]. Trehan G, Bruge H, Vinchon M, et al. MR imaging in the diagnosis of desmoplastic infantile tumor: retrospective study of six cases. AJNR Am J Neuroradiol. 2004 Jun-Jul. 25(6):1028-33. [Medline]. Rosenblum MK. Desmoplastic infantile astrocytoma/desmoplastic infantile ganglioglioma. McLendon RE, Rosenblum MK, Bigner DD, eds. Russell and Rubinstein's Pathology of Tumors of the Nervous System. 7th ed. London, UK: Edward Arnold; 2006. 321-31. Prayson RA. Gliofibroma: a distinct entity or a subtype of desmoplastic astrocytoma?. Hum Pathol. 1996 Jun. 27(6):610-3. [Medline]. Cerda-Nicolas M, Lopez-Gines C, Gil-Benso R, et al. Desmoplastic infantile ganglioglioma. Morphological, immunohistochemical and genetic features. Histopathology. 2006 Apr. 48(5):617-21. [Medline]. De Munnynck K, Van Gool S, Van Calenbergh F, et al. Desmoplastic infantile ganglioglioma: a potentially malignant tumor?. Am J Surg Pathol. 2002 Nov. 26(11):1515-22. [Medline]. Tantbirojn P, Sanpavat A, Bunyaratavej K, Desudchit T, Shuangshoti S. Desmoplastic infantile ganglioglioma with high proliferation index: report of a case. J Med Assoc Thai. 2005 Dec. 88(12):1962-5. [Medline]. Lonnrot K, Terho M, Kahara V, Haapasalo H, Helen P. Desmoplastic infantile ganglioglioma: novel aspects in clinical presentation and genetics. Surg Neurol. 2007 Sep. 68(3):304-8; discussion 308. [Medline]. Kros JM, Delwel EJ, de Jong TH, et al. Desmoplastic infantile astrocytoma and ganglioglioma: a search for genomic characteristics. Acta Neuropathol. 2002 Aug. 104(2):144-8. [Medline]. Brat DJ, Scheithauer BW, Staugaitis SM, Cortez SC, Brecher K, Burger PC. Third ventricular chordoid glioma: a distinct clinicopathologic entity. J Neuropathol Exp Neurol. 1998 Mar. 57(3):283-90. [Medline]. Wanschitz J, Schmidbauer M, Maier H, Rossler K, Vorkapic P, Budka H. Suprasellar meningioma with expression of glial fibrillary acidic protein: a peculiar variant. Acta Neuropathol. 1995. 90(5):539-44. [Medline]. Horbinski C, Dacic S, McLendon RE, et al. Chordoid glioma: a case report and molecular characterization of five cases. Brain Pathol. 2009 Jul. 19(3):439-48. [Medline]. Vanhauwaert DJ, Clement F, Van Dorpe J, Deruytter MJ. 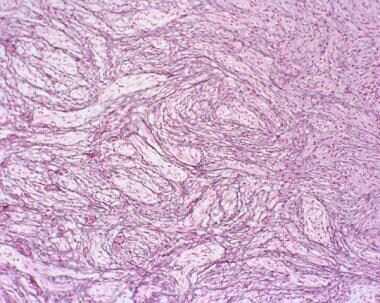 Chordoid glioma of the third ventricle. Acta Neurochir (Wien). 2008 Nov. 150(11):1183-91. [Medline]. Piepmeier J, Baehring JM. Surgical resection for patients with benign primary brain tumors and low grade gliomas. J Neurooncol. 2004 Aug-Sep. 69(1-3):55-65. [Medline]. Iwami K, Arima T, Oooka F, Fukumoto M, Takagi T, Takayasu M. Chordoid glioma with calcification and neurofilament expression: case report and review of the literature. Surg Neurol. 2009 Jan. 71(1):115-20; discussion 120. [Medline]. Cenacchi G, Roncaroli F, Cerasoli S, Ficarra G, Merli GA, Giangaspero F. Chordoid glioma of the third ventricle: an ultrastructural study of three cases with a histogenetic hypothesis. Am J Surg Pathol. 2001 Mar. 25(3):401-5. [Medline]. Pasquier B, Peoc'h M, Morrison AL, et al. 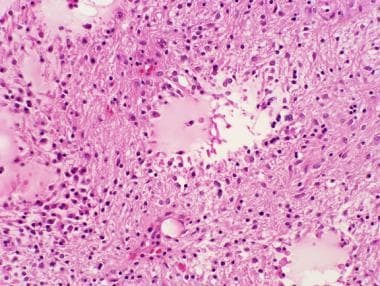 Chordoid glioma of the third ventricle: a report of two new cases, with further evidence supporting an ependymal differentiation, and review of the literature. Am J Surg Pathol. 2002 Oct. 26(10):1330-42. [Medline]. Reifenberger G, Weber T, Weber RG, et al. 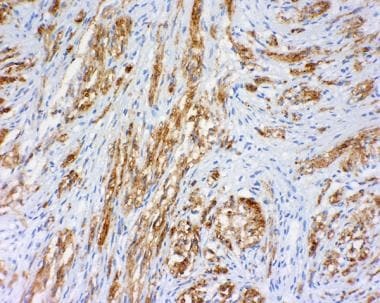 Chordoid glioma of the third ventricle: immunohistochemical and molecular genetic characterization of a novel tumor entity. Brain Pathol. 1999 Oct. 9(4):617-26. [Medline]. Jain D, Sharma MC, Sarkar C, et al. Chordoid glioma: report of two rare examples with unusual features. Acta Neurochir (Wien). 2008 Mar. 150(3):295-300; discussion 300. [Medline]. Baehring JM, Bannykh S. Chordoid glioma of the third ventricle. J Neurooncol. 2006 Feb. 76(3):269. [Medline]. Jung TY, Jung S. Third ventricular chordoid glioma with unusual aggressive behavior. Neurol Med Chir (Tokyo). 2006 Dec. 46(12):605-8. [Medline]. Pomper MG, Passe TJ, Burger PC, Scheithauer BW, Brat DJ. 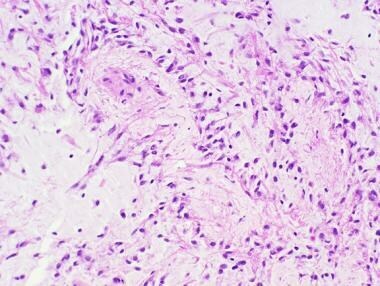 Chordoid glioma: a neoplasm unique to the hypothalamus and anterior third ventricle. AJNR Am J Neuroradiol. 2001 Mar. 22(3):464-9. [Medline]. Kurian KM, Summers DM, Statham PF, Smith C, Bell JE, Ironside JW. Third ventricular chordoid glioma: clinicopathological study of two cases with evidence for a poor clinical outcome despite low grade histological features. Neuropathol Appl Neurobiol. 2005 Aug. 31(4):354-61. [Medline]. Brat DJ. 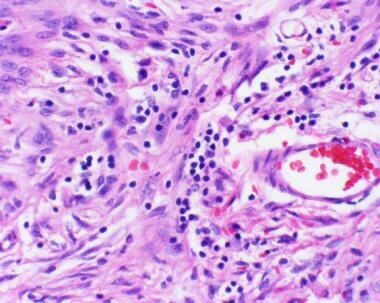 Chordoid glioma of the third ventricle. McLendon RE, Rosenblum MK, Bigner DD, eds. Russell and Rubinstein's Pathology of Tumors of the Nervous System. 7th ed. London, UK: Edward Arnold; 2006. 229-34. Lopes MBS, Thapar K, Horvath E, Kovacs K. Tumors of the sellar region. McLendon RE, Rosenblum MK, Bigner DD, eds. Russell and Rubinstein's Pathology of Tumors of the Nervous System. 7th ed. London, UK: Edward Arnold; 2006. 663-764. Jenevein EP. 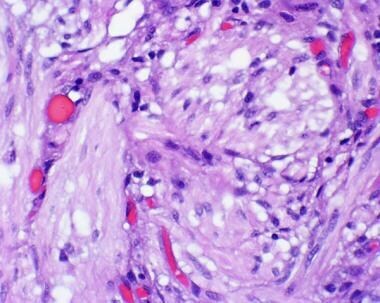 A neurohypophyseal tumor originating from pituicytes. Am J Clin Pathol. 1964 May. 41:522-6. [Medline]. Liss L. Pituicytoma, a tumor of the hypothalamus: clinicopathological report of a case. AMA Arch Neurol Psychiatry. 1958 Nov. 80(5):567-76. [Medline]. Liss L. The cellular elements of the human neurohypophysis; a study with silvercarbonate. J Comp Neurol. 1956 Dec. 106(2):507-25. [Medline]. Takei H, Goodman JC, Tanaka S, Bhattacharjee MB, Bahrami A, Powell SZ. Pituicytoma incidentally found at autopsy. Pathol Int. 2005 Nov. 55(11):745-9. [Medline]. Gibbs WN, Monuki ES, Linskey ME, Hasso AN. Pituicytoma: diagnostic features on selective carotid angiography and MR imaging. AJNR Am J Neuroradiol. 2006 Sep. 27(8):1639-42. [Medline]. Lieberman KA, Wasenko JJ, Schelper R, Swarnkar A, Chang JK, Rodziewicz GS. Tanycytomas: a newly characterized hypothalamic-suprasellar and ventricular tumor. AJNR Am J Neuroradiol. 2003 Nov-Dec. 24(10):1999-2004. [Medline]. Scheithauer BW. The neuropathology of tuberous sclerosis. J Dermatol. 1992 Nov. 19(11):897-903. [Medline]. Jozwiak J, Kotulska K, Jozwiak S. Similarity of balloon cells in focal cortical dysplasia to giant cells in tuberous sclerosis. Epilepsia. 2006 Apr. 47(4):805. [Medline]. Goh S, Butler W, Thiele EA. Subependymal giant cell tumors in tuberous sclerosis complex. Neurology. 2004 Oct 26. 63(8):1457-61. [Medline]. Vinters HV, Miyata H. Neuropathologic features of tuberous sclerosis. McLendon RE, Rosenblum MK, Bigner DD, eds. Russell and Rubinstein's Pathology of Tumors of the Nervous System. 7th ed. London, UK: Edward Arnold; 2006. 955-70. Narayanan V. Tuberous sclerosis complex: genetics to pathogenesis. Pediatr Neurol. 2003 Nov. 29(5):404-9. [Medline]. Gomez MRS, Sampson JR, Whittemore VH. Tuberous Sclerosis Complex. 3rd ed. New York, NY: Oxford University Press; 1999. Sharma MC, Ralte AM, Gaekwad S, Santosh V, Shankar SK, Sarkar C. Subependymal giant cell astrocytoma--a clinicopathological study of 23 cases with special emphasis on histogenesis. Pathol Oncol Res. 2004. 10(4):219-24. [Medline]. Cuccia V, Zuccaro G, Sosa F, Monges J, Lubienieky F, Taratuto AL. 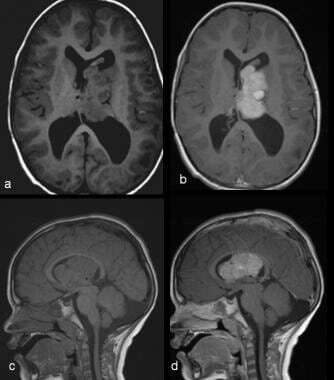 Subependymal giant cell astrocytoma in children with tuberous sclerosis. Childs Nerv Syst. 2003 Apr. 19(4):232-43. [Medline]. de Ribaupierre S, Dorfmuller G, Bulteau C, et al. Subependymal giant-cell astrocytomas in pediatric tuberous sclerosis disease: when should we operate?. Neurosurgery. 2007 Jan. 60(1):83-9; discussion 89-90. [Medline]. O'Callaghan FJ, Martyn CN, Renowden S, Noakes M, Presdee D, Osborne JP. Subependymal nodules, giant cell astrocytomas and the tuberous sclerosis complex: a population-based study. Arch Dis Child. 2008 Sep. 93(9):751-4. [Medline].